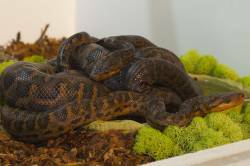 Description: Selling (5) unsexed Dominican Red Mountain Boas, born aug 2014. All are "Red" morphs, eating f/t small to medium feeder lizards. The Adult breeder pair is from Tom Crutchfield. Picture clarity suffered some during the upload. Asking $275 each + shipping. Package deals available. I've seen prices from Tom selling more than DOUBLE what i'm asking. DRMB's are very docile snakes and only typically musk as a defensive mechanism. Color's will get brighter as the snake ages along with pattern will become more defined.